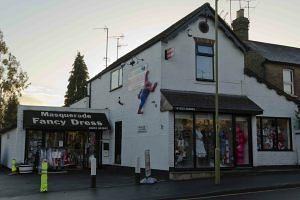 Where can I hire a fancy dress costumes near Edgware? Where can I buy fancy dress outfits near Edgware? Where can I buy fancy dress or party accessories in Edgware? I need some fancy dress ideas for a party in Edgware? Just a few miles from Edgware and North London is Masquerade Fancy Dress of Watford. Masquerade has a wide range of quality costumes and accessories which you can hire and a variety of outfits and accessories to buy. Whether it is for a fancy dress party, charity event, the local amateur dramatics or a religious celebration we’re sure we will have something for you to choose from. So, whatever the fancy dress theme – 20s, 40s, 70s or 80s, Gangster and Moll, Rock ‘n’ Pop or a fantasy or historical character – we should have a costume for you. Or, if you have a specific fancy dress outfit in mind, why not give us a call and we can advise you on the costumes that we have to hire or buy. We have a wealth of experience and knowledge and a range of fancy dress ideas to help you choose the best costume for your party or event. Call or come in and visit us – free on-site parking!